SATURDAY MORNING – Popeye, born in 1929 as a walk-on character in a long-forgotten comic strip called Thimble Theatre, has died, a victim of the e. coli outbreak. "It's inconceivable that his famous love of spinach has come to this," said longtime friend E. Wellington Wimpy. "So, what, does that mean all the seven-year-olds who wouldn't eat their spinach were right all along?" The former Sailor Man spent the last years of his life bitter about getting stiffed out of his share of the profits from the 1980 movie about his life, which he always maintained was both exaggerated and inaccurate, and saddened by the decline of the U.S. Merchant Marine fleet. Always known as a brawler—although with a soft heart—he had become increasingly truculent in old age. He was predeceased by his companion Ms. Oyl, whom he never married. Despite her high-profile work with Anorexia Nervosa sufferers, she had never entirely escaped the ravages of the disease herself, and she died of complications from it in 1991. Their "adopted" child Swee' Pea, now known as S. Pea, is a real estate developer in Encino. "I never understood him," said Pea. "No, seriously, with that pipe and the way he talked, you never knew what the hell Dad was saying." 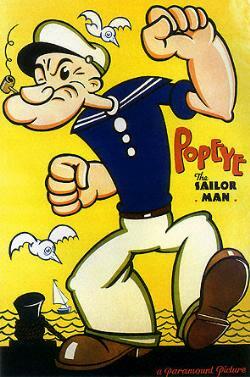 Popeye's iconic early sayings, including "I yam what I yam" and "That's all I can stands, and I can't stands no more!" remain his best known. He was charged and tried in the beating death of Bluto in 1985, but was exonerated. Popeye had been living in retirement in Iowa City, far from the sea he once loved, and had been in good health for his age. He was 77. Didn't he eat canned spinach? You'd think botulism would have gotten him first. I usually cook spinach first. I didn't really care for it until I had my first spinach pizza. A fitting obit for one of my childhood heroes. Mike, yer just too funny! That was very poignant, yet humerous. Mike, perhaps you should consider writing for a living.